Forever has great experience in handling and processing of fresh Aloe vera products are popular all over the world. Our plantations are in USA, Texas, Mexico and the Dominican Republic. 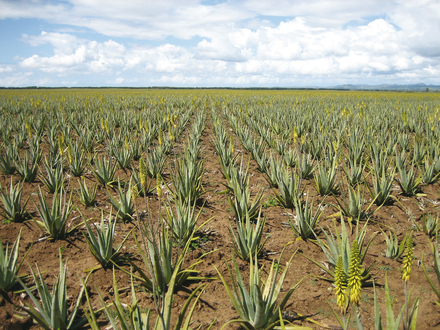 As the world's largest producer of Aloe vera is natural for us to protect the environment. We grow as organic and crop rotation. When the leaves are harvested, they undergo a thorough cleaning process where they are rinsed several times in cold water and even high-pressure cleaning. Any surplus is removed and the leaves are checked to ensure that they are not damaged. We take the Aloe vera gel from the plant's interior, where it is well protected against external influences. In this way recovered gel in its purest form. The clean, freshly pressed gel is collected, and must residues are removed. It then passes through the gel a patented stabilization process that protects against oxidation. Leafy and must residues end up on the compost and is part of the natural cycle. Now we have a good basic product, but we will be sure that it always has the same high quality. The gel therefore undergoes laboratory testing and analysis before issuing an ingredient in our products.